What is LinuxWorld Conference & Expo (LWE)? LinuxWorld Conference & Expo (LWE) is a Linux trade show that focuses on open source and GNU/Linux solutions in the information technology (IT) sector. The San Francisco Bay Area event is held every August. Wikipedia has more. 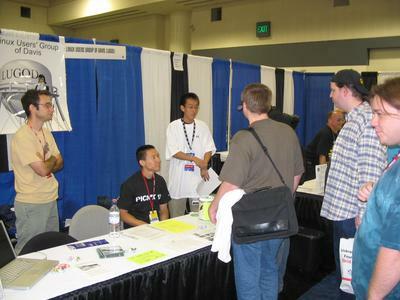 In August 2003 and August 2004, LUGOD exhibited at LinuxWorld Expo in San Francisco. In 2003 we had our own booth, which we ended up sharing with the Electronic Frontier Foundation. In 2004 we participated in a multi-LUG booth along with BALUG, PenLUG and RoseLUG. LinuxWorld Conference & Expo takes place August 6th through the 9th at the Moscone Center in San Francisco. IDG, the company that puts together LinuxWorld, has set up booth #644 for various Linux User Groups (LUGs). Jim Stockford from SF-LUG in San Francisco is currently expecting LUGs such as LUGOD to provide some handout materials for the event, as well as volunteers to help staff the booth. We are working with Briana Pontremoli, Marketing Manager for IDG World Expo. Two LUGOD members can get Exhibitor passes if they'd like to volunteer at the multi-LUG booth at this year's expo. Contact Bill Kendrick, or post to vox-outreach if you'd like to help. Note (2007-08-03): Briana points out that online registration closes on Sunday! As of August 5, one pass is still available to a LUGOD volunteer! Six passes are still available overall. (E) — Signed up to receive an Exhibitor badge. Note: For setup and breakdown (when the Expo floor is not open to the general public), only those with exhibitors badges can volunteer! What's our purpose at LinuxWorld Expo? Our main purpose is to get the word out about the various user groups, so that new Linux users know they have a community that they can become part of, and get help from. We also help to promote the annual Picn*x event, the free picnic and barbecue celebrating the Linux operating system's birthday. (That event takes place in Sunnyvale, California, typically on the Saturday following LinuxWorld Expo). If you can think of other ways to make our booth even more beneficial to the attendees of LinuxWorld Expo, let us know! If you're planning on attending LWE, and wish to help staff LUGOD's section of the LUG booth, or you'd like to attend specifically to help out, please e-mail pr@lugod.org or post a message to LUGOD's vox-outreach mailing list. Let us know what day(s) and hours you'd like to help, where you're coming from, how you're getting to the event, and if you need a ride, want to take public transit, or can offer a ride to other volunteers or attendees.